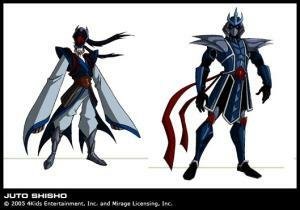 Juto-Shisho is a member of the Ninja Tribunal. He was the second to reveal his true form to the Turtles and their Acolyte friends. He is the ninjutsu master of weapons. He prominently appeared in the 2003 animated series’ fifth season he also appeared in the Fast Forward episode The Journal and once more in Back to the Sewer during the wedding of Casey Jones andApril O’Neil. He was voiced by Marc Thompson.